Environment variables are a set of dynamic named values that can affect the way running processes will behave on a computer. They can be said in some sense to create the operating environment in which a process runs. For example, an environment variable with a standard name can store the location that a particular computer system uses to store temporary files - this may vary from one computer system to another. 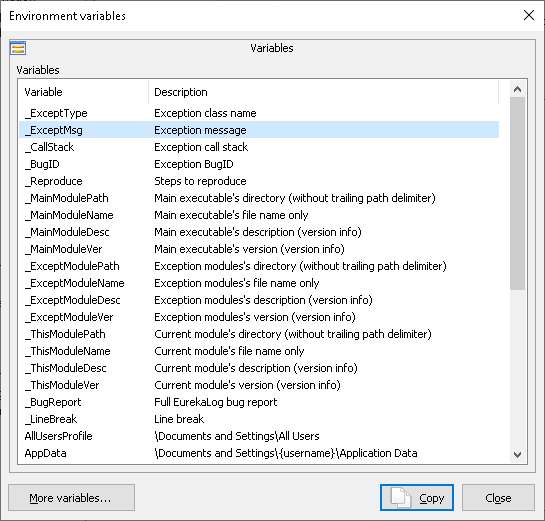 A process which invokes the environment variable by (standard) name can be sure that it is storing temporary information in a directory that exists and is expected to have sufficient space. You can use environment variables in any text values in your project settings. You can insert variable by using "Variables" window. Variable is inserted as special tag. When you run your application at run-time, any variable value will be replaced with actual value, which is calculated at run-time. For example, if you set your folder for saving bug-report to "%APPDATA%\MyBugReports" then your bug reports will be saved to C:\Users\UserName\AppData\Roaming\MyBugReports\ or C:\Documents and Settings\UserName\Application Data\MyBugReports - depending on real value of %APPDATA% variable at run-time. Note: variables names are case-insensitive. "Copy" button will close the window with copying selected variable into clipboard. Alternatively: you can just double-click on variable in the list. "Close" button will close the window without any action. 2. Select variable that you want to use. 3. Click "Copy" (or double-click variable). Dialog will be closed. 4. Paste variable name from clipboard (Ctrl + V or Shift + Ins) to target setting's edit box. • This dialog suggests you only build-in special pseudo-variables (those with names started with "_") and commonly used variables. However, you can use any environment variable (even if it's not listed in this dialog). • You can also use relative file paths. For example, any path which starts with . (dot) will be relative to your current executable (regardless of actual current folder, which may be changed, say, by system open dialog). For example, ".\BugReport.el" means file in the same folder as your executable. So, while variables is an easy way to add some dynamic behaviour to EurekaLog options, their powers are limited. There may be no variable for your specific need or it may be not applicable to desired options (such as checked/unchecked option kind). In this case - you can set up/alter options from code.